I’m fully aware of the many famous and historic things that make York ‘special’. The buildings tourists flock to see. But one of the reasons this site exists is to appreciate the things more ordinary, the kinds of places all towns have. And perhaps, sometimes, to mark their passing, in my own way. This sign is tucked away in a corner on Sycamore Place, at the bottom of Bootham Terrace. I’ve walked past it many many times, down the alley on the other side of one of its boundaries. I wasn’t aware of the club and its green until I noticed its inclusion on the York Local List. An application to demolish the club house has recently been approved. It may already have gone. These photos were taken a few weeks ago. It’s difficult to see the club house, and impossible to see the bowling green alongside it, because of a thick hedge and tall double gate. What I could see was this rather stylish, if faded, painted wooden sign at the entrance, and an equally charming metal sign on the club house building. The objections to the proposed destruction of the Exhibition bowling green behind the art gallery helped focus my mind on a ‘cultural shift’ I’d been vaguely noticing for some years – how many bowling greens have been eradicated and built on. I know that the greens at Clarence Gardens are getting a lot of extra use from the many relocated bowling clubs. I know nothing about bowling. Its image, I know, is rather old-fashioned, and it’s associated with the more mature members of society. All I can say is that on at least two occasions when I’ve been roaming about York with my camera, I’ve had my attention captured by the sight of groups of figures, dressed in white, standing quiet, on vivid green grass, watching as one member leans and bowls. Once on a summer evening, in low light, when passing Clarence Gardens. Once in late morning, across Scarcroft Stray. It seemed a sight in some way timeless, stretching back, I’m not sure what to, something indefinable, perhaps a childhood memory. Many of us probably think of bowling as a 20th century game. But it has a very long history, going back centuries before that. Perhaps it was the early 20th century when it became particularly popular. 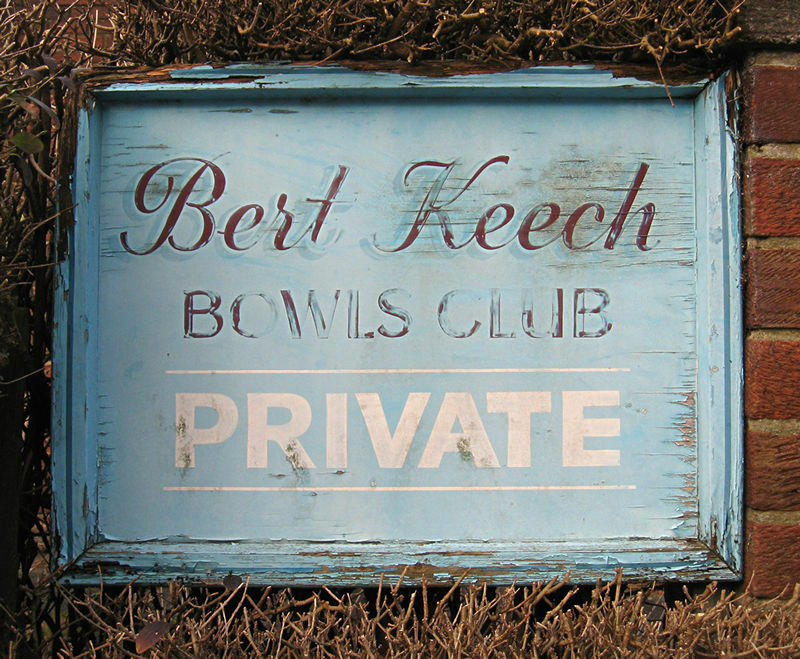 The Bert Keech club was founded in 1912. It almost made it to a hundred years, but closed in 2008. Its centenary will be marked by the demolition of the club house. The place may not have meant anything to me, but I imagine it meant a lot to many people, by the fact that it’s on the Local List. I hope someone with a connection to the club is going to claim that metal sign. It’s very faded now, but it’s still recognisable as being a view of Bootham Bar with the Minster behind. As for the wooden one – it’s very elegantly done. They don’t paint them like that any more. Among York’s newer addresses is a ‘Bowling Green Court’ and a ‘Bowling Green Croft’. Perhaps in the past streets were named like this because they led to a bowling green. Now it’s because they were built on one. Perhaps at the bottom of Sycamore Place we’ll have a Bert Keech Mews, when the housing market picks up. I had a look at the report associated with the planning application. It states that photographs should be taken before demolition, to be submitted for inclusion on the Historic Environment Record. This is recognised as important, these days, where a ‘heritage asset is to be lost’. I’d already made an attempt to record this heritage asset, in an unofficial capacity. Sadly I’m too short to get a good photo of a high-up plaque behind a high hedge. I’m an outsider, observing, taking photos of signs. Add a comment if you’re reading this and knew the place. 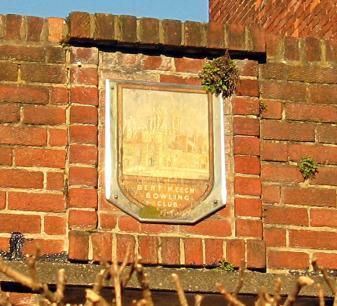 The wider background, and history – Bowls: The quintessentially British sport under threat. Refers to a proposed bill by John Woodcock, MP, in 2011 – more info here. his bowling.Johnny Sutton and his modernaire dance band made the back hair tingle for us youth. 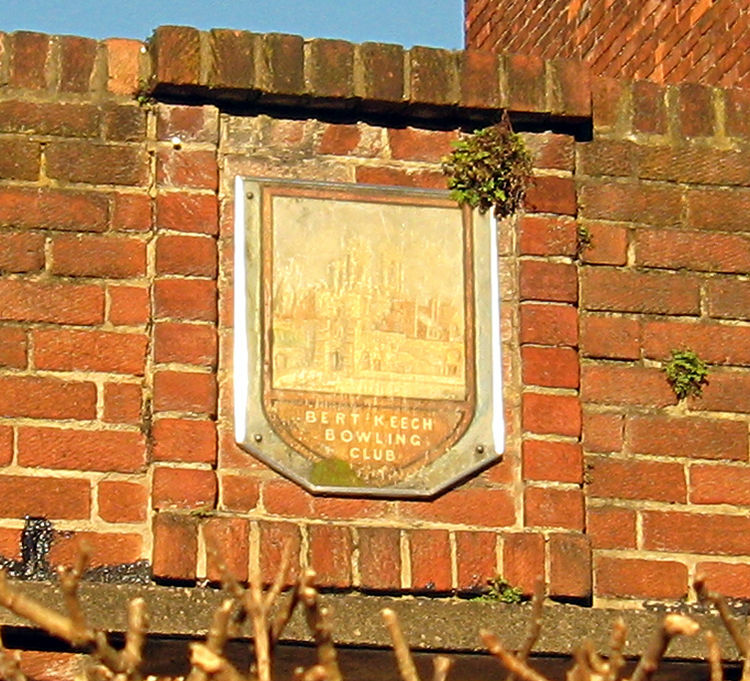 Bowling Greens – there was one on the corner of Kent Street and Cemetery Road and one on the site of the now demolished Barbican baths – one replaced the other but I’m not sure which way round.